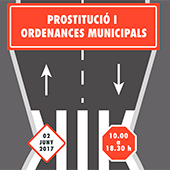 We are pleased to invite you to the “Prostitution and Municipal Ordinances” Conference organized by the Antigone Group (UAB) and the GREDI (UB). This day is carried out within the framework of the Project I+D+i “El desarrollo de los derechops fundamentales en las ordenanzas municipales: límites y vulneraciones de derechos desde la perspectiva de género” (DER2014-58553-R) and the projectGENCPOLIS (FEM2015-71218-REDT), both financed by the Ministry of Economy, Industry and Competitiveness. http://antigonaen.uab.cat/wp-content/uploads/2017/05/prostitucio.jpg 170 170 2145216 http://158.109.137.58/antigona/wp-content/uploads/2016/10/LogoUAB-300x178.png 21452162017-05-09 11:45:352019-03-18 14:01:05Conference "Prostitution and Municipal Ordinances"